An electric or petrol log splitter makes preparing logs for the open fire or wood burner a safer and easier task. With no need for strenuous strikes of the logs using a heavy axe, an electric or petrol log splitter is far more comfortable method of reducing the size of the logs ready to be put on the fire. The Mitox range of log splitters consists of 2 horizontal models which are ideal for the domestic user. 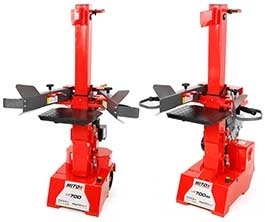 The smaller of the two models is the LS40, which due to its compact dimensions is easy to store when not in use and can be used either on the floor close to the woodpile or on a work bench An optional stand can be fitted to the LS40 raising the wood splitter to a comfortable working height and enabling it to be easily transported on the transport wheels. 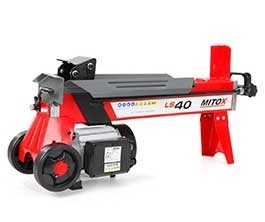 The LS40 generates 4 tonnes of splitting force and is capable of splitting logs up to 37cm in length and 25cm in diameter into two pieces. If you require a splitter capable of splitting harder, longer logs then you should consider the LS65X. With the capacity to split logs up to 52cm in length and a maximum splitting force of 6.5 tonnes, it can handle most domestic wood splitting jobs. The LS65X has the additional benefit of being supplied with a MultiSplit 4-Way splitting wedge speeding up the process as the wood is split into four manageable pieces. The stand included with the LS65X raises the working height and features transport wheels which enable it to be easily moved to the working area. The LS700 electric log splitter and the LS700BS petrol powered vertical wood splitters are the largest models in the range and are designed for the largest domestic wood splitting tasks. Both models produce a maximum splitting force of 7 tonnes and can handle logs up to 104cm long and 32cm in diameter. The petrol powered LS700BS can be used in any outdoor location so is the ideal choice if the wood pile is situated in an area without an electricity supply. 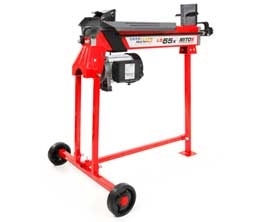 Whether you are choosing one of the smaller horizontal log splitters or the larger horizontal models, their two handed operation ensures that your hands are away from the wood being split and the QuickSplit function is perfect when working with shorter logs as you are able to set the starting position of the push block. Our range of log splitters are currently in our Autumn sale with prices starting from just £199.